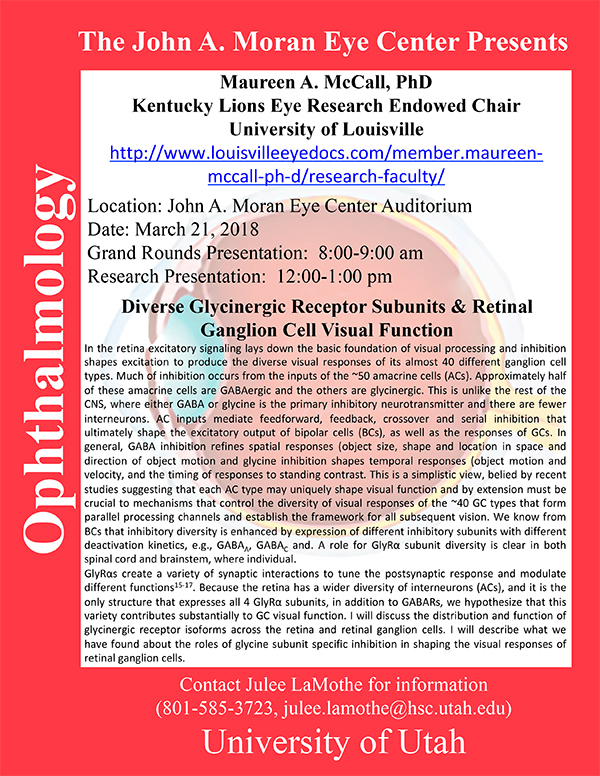 Maureen A. McCall, Professor and Kentucky Lions Eye Research Endowed Chair, at University of Louisville will be delivering a seminar on “Diverse Glycinergic Receptor Subunits & Retinal Ganglion Cell Visual Function” on Wednesday, March 21st at 12:00 Noon in the Moran Eye Center auditorium. Abstract: In the retina excitatory signaling lays down the basic foundation of visual processing and inhibition shapes excitation to produce the diverse visual responses of its almost 40 different ganglion cell types. Much of inhibition occurs from the inputs of the ~50 amacrine cells (ACs). Approximately half of these amacrine cells are GABAergic and the others are glycinergic. This is unlike the rest of the CNS, where either GABA or glycine is the primary inhibitory neurotransmitter and there are fewer interneurons. AC inputs mediate feedforward, feedback, crossover and serial inhibition that ultimately shape the excitatory output of bipolar cells (BCs), as well as the responses of GCs. In general, GABA inhibition refines spatial responses (object size, shape and location in space and direction of object motion and glycine inhibition shapes temporal responses (object motion and velocity, and the timing of responses to standing contrast. This is a simplistic view, belied by recent studies suggesting that each AC type may uniquely shape visual function and by extension must be crucial to mechanisms that control the diversity of visual responses of the ~40 GC types that form parallel processing channels and establish the framework for all subsequent vision. We know from BCs that inhibitory diversity is enhanced by expression of different inhibitory subunits with different deactivation kinetics, e.g., GABAA, GABAC and. A role for GlyRα subunit diversity is clear in both spinal cord and brainstem, where individual. GlyRαs create a variety of synaptic interactions to tune the postsynaptic response and modulate different functions15-17. Because the retina has a wider diversity of interneurons (ACs), and it is the only structure that expresses all 4 GlyRα subunits, in addition to GABARs, we hypothesize that this variety contributes substantially to GC visual function. I will discuss the distribution and function of glycinergic receptor isoforms across the retina and retinal ganglion cells. I will describe what we have found about the roles of glycine subunit specific inhibition in shaping the visual responses of retinal ganglion cells. 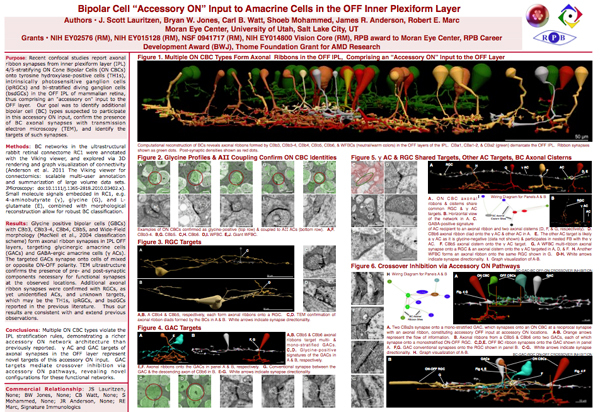 This abstract was presented today at the 2014 Association for Research in Vision and Opthalmology (ARVO) meetings in Orlando, Florida by J Scott Lauritzen, Noah T. Nelson, Crystal L. Sigulinsky, Nathan Sherbotie, John Hoang, Rebecca L. Pfeiffer, James R. Anderson, Carl B. Watt, Bryan W. Jones and Robert E. Marc. Purpose: Converging evidence suggests that large- and intermediate-scale neural networks throughout the nervous system exhibit small world’ design characterized by high local clustering of connections yet short path length between neuronal modules (Watts & Strogatz 1998 Nature; Sporns et al.2004 Trends in Cog Sci). It is suspected that this organizing principle scales to local networks (Ganmor et al. 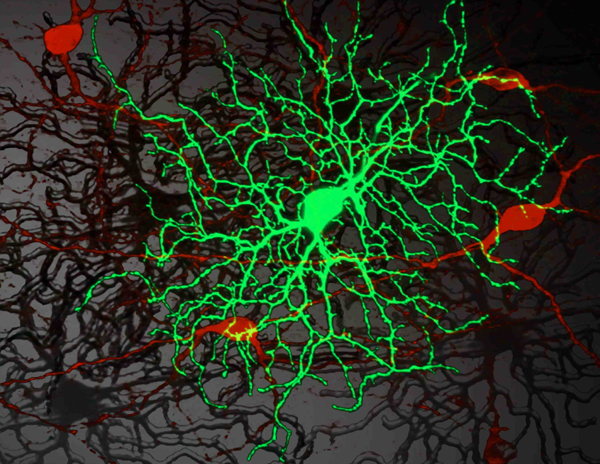 2011 J Neurosci; Sporns 2006 BioSystems) but direct observation of synapses and local network topologies mediating small world design has not been achieved in any neuronal tissue. We sought direct evidence for synaptic and topological substrates that instantiate small world network architectures in the ON inner plexiform layer (IPL) of the rabbit retina. 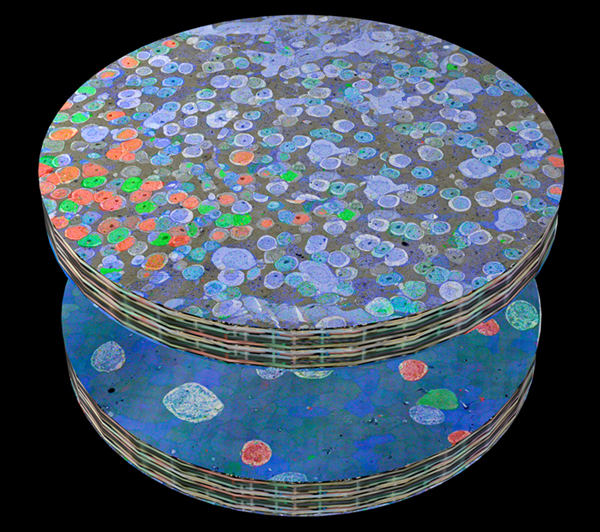 To test this we mined ≈ 200 ON cone bipolar cells (BCs) and ≈ 500 inhibitory amacrine cell (AC) processes in the ultrastructural rabbit retinal connectome (RC1). Methods: BC networks in RC1 were annotated with the Viking viewer and explored via graph visualization of connectivity and 3D rendering (Anderson et al. 2011 J Microscopy). Small molecule signals embedded in RC1 e.g. GABA glycine and L-glutamate combined with morphological reconstruction and connectivity analysis allow for robust cell classification. MacNeil et al. (2004 J Comp Neurol) BC classification scheme used for clarity. Results: Homocellular BC coupling (CBb3::CBb3 CBb4::CBb4 CBb5::CBb5) and within-class BC inhibitory networks (CBb3 → AC –| CBb3 CBb4 → AC –| CBb4 CBb5 → AC –| CBb5) in each ON IPL strata form laminar-specific functional sheets with high clustering coefficients. Heterocellular BC coupling (CBb3::CBb4 CBb4::CBb5 CBb3::CBb5) and cross-class BC inhibitory networks (CBb3 → AC –| CBb4 CBb4 → AC –| CBb3 CBb4 → AC –| CBb5 CBb5 → AC –| CBb4 CBb3 → AC –| CBb5 CBb5 → AC –| CBb3) establish short synaptic path lengths across all ON IPL laminae. Conclusions: The retina contains a greater than expected number of synaptic hubs that multiplex parallel channels presynaptic to ganglion cells. The results validate a synaptic basis (ie. direct synaptic connectivity) and local network topology for the small world architecture indicated at larger scales providing neuroanatomical plausibility of this organization for local networks and are consistent with small world design as a fundamental organizing principle of neural networks on multiple spatial scales. Support: NIH EY02576 (RM), NIH EY015128 (RM), NSF 0941717 (RM), NIH EY014800 Vision Core (RM), RPB CDA (BWJ), Thome AMD Grant (BWJ). This Short Communication published in the European Journal of Neuroscience back in 2000 by Lucia Galli-Resta, Elena Novelli, Maila Volpini and Enrica Strettoi was a paper I did not know existed. That said, I ran into it the other day looking for some reference material and found it to be quite useful. This communication represents an analysis of the cholinergic amacrine cell mosaics in the C57Bl6/J murine retina. It served as a useful baseline for cell positioning, and cell mosaicing in both cholinergic arrays of the retina and is a nice analysis that should serve as a reference point for future genetic analysis studies in normal and pathological retinal tissues. 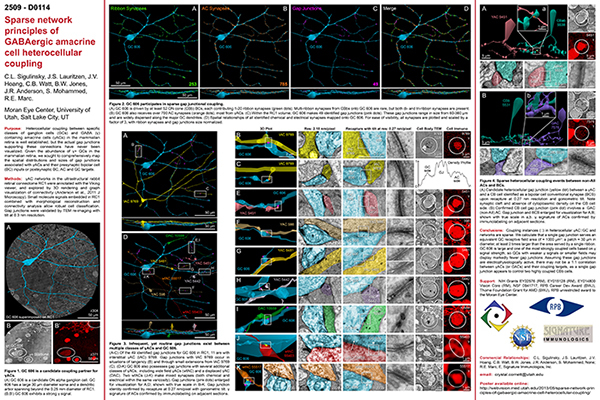 Enrica Strettoi’s laboratory has been carefully exploring the functional organization of the retina for some time now in the normal and pathological states and its always a joy to discover her work in the literature, even if it is 13 years old. This abstract was presented today at the Association for Research in Vision and Opthalmology (ARVO) meetings in Ft. Lauderdale, Florida by Robert E. Marc, J. Scott Lauritzen, Bryan W. Jones, Carl B. Watt and James R. Anderson. This paper by Q. 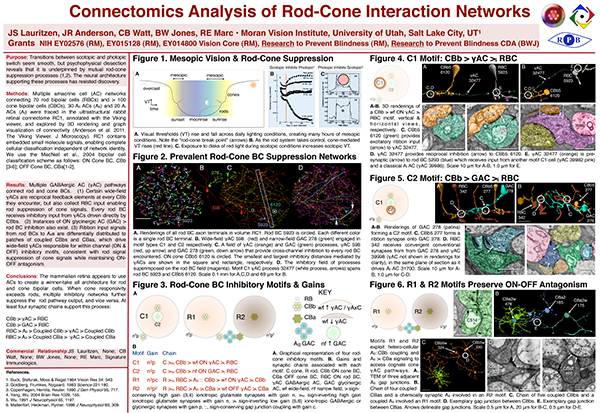 He, Wang P and Ning Tian characterizes the developmental profiles of the light evoked excitatory and inhibitory synaptic inputs from ON and OFF synaptic pathways in the retina, the light evoked synaptic outputs and the sensitivity of the light evoked synaptic inputs and outputs to light deprivation of retinal ganglion cells (RGCs) and displaced amacrine cells (ACs) of developing mouse retina. 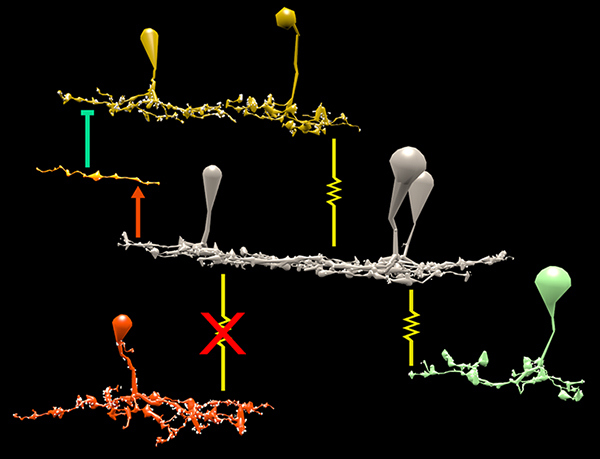 The results strongly suggest that spontaneous and light-evoked synaptic activities of RGCs and ACs are regulated by different synaptic mechanisms.